The Rural Economy Research Group (RERG) met for the fifth time in the House of Lords on the 28th October 2015. The annual meeting was attended by a broad range of peers, ministers, scientists, academics and vets and featured fascinating presentations on the future of rural businesses, the challenges facing the UK water industry and the importance of rural landscapes for human health. The meeting was kindly sponsored by the Royal Agricultural University, the University of Liverpool and the University of Nottingham and Chaired by Professor the Lord Trees of the Ross. The theme of the meeting was “Healthy, Wealthy Rural Communities” and this broad title brought together a diverse group of speakers. Professor Paul Wilson (Professor of Agricultural Economics at the University of Nottingham) started the meeting with an overview of the UK agricultural sector using data from the Farm Business Survey that has been collecting data on farm businesses since 1936. In the UK there are currently 290,000 registered farmers with a total income of £5.4 billion. He discussed how the future might look for farmers if subsidies were removed and showed the variability in levels of reliance on subsidies across farming sectors from high reliance in cereal farmers and lowland grazing through to lower reliance in the pig and poultry sectors. He ended the talk by looking at the future of the dairy industry and asked the question “Will dairy farmers ever be happy again?”. The short answer is that some will and some won’t. There is huge variation in the profitability of dairy businesses with the top 10% making a profit of £80 per cow and the bottom 20% loosing £50 per cow. It was interesting to note that the top 10 most profitable dairy producers use relatively fewer concentrates and have lower yield per cow than some less profitable farms emphasising the importance of good farm practices to reduce cost per litre of milk and ensure that dairy businesses remain profitable. The second talk came from Dr Robert Ward, Director of Science at the British Geological Survey. He started by describing how the resilience of water supply varies across the UK with South East England most at risk from drought. He explained how public water supplies are resilient to short-term droughts but private supplies are much more vulnerable. There are 100,000 private water supplies to rural communities suggesting that these communities are particularly at risk from the effects of drought. He described how the last 4 years have seen unprecedented fluctuations in water levels with both historical lows in 2012 and highs in 2014 and with climate models predicting drier summers and wetter winters the future challenges to the water industry remain uncertain. He ended his talk by discussing the problem of nitrate pollution in water supplies and the 3D modelling work that is being carried out to minimise the risk of aquifer pollution as a consequence of shale gas and oil extraction. The final talk came from Dr Rebecca Lovell and Dr Ben Wheeler from the University of Exeter who discussed evidence for the positive effects of the natural environment on human health. In general those living in rural areas are reported to have better health and longer life expectancy and there is increasing recognition of the value of greenspaces in reducing stress and stimulating physical activity. Coastal areas of the UK receive 1.4 billion visits per year for the purposes of walking dogs alone and it has been estimated that these visits bring £19 billion to these areas. The value of rural landscapes extends far beyond agricultural income and the growing appreciation of the role of these landscapes for public services to human health and the environment is likely to play an increasing role in decision-making of farmers, land manager and policy makers. 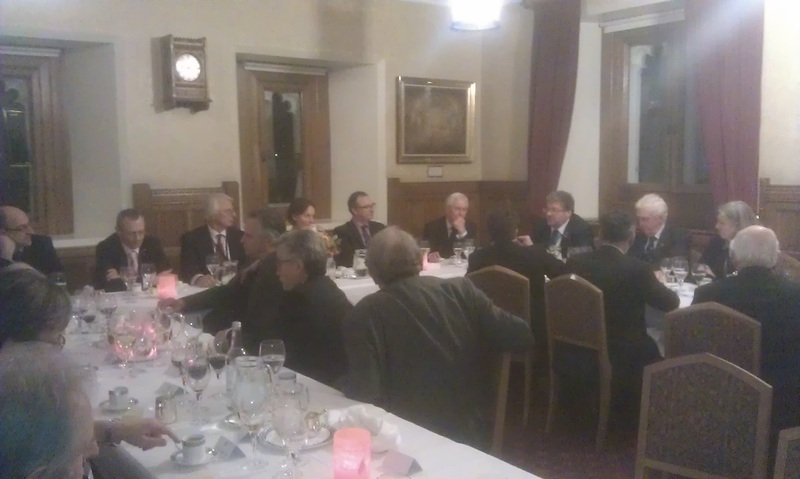 The meeting ended with a dinner in the Attlee Room at the House of Lords and a lively and thought-provoking discussion of many of the points raised. It was clear to see how the future of rural economies is important not just for farmers but for all of us and inspiring to see such a broad range of people brought together to discuss the challenges that we face. By working together we can help to ensure that rural economies remain sustainable and safeguard the natural environment that is essential to our future health and well-being.